Many parents ask, but why? What's the point in decorating the bed, if the child and so are not deprived of toys. The meaning is. 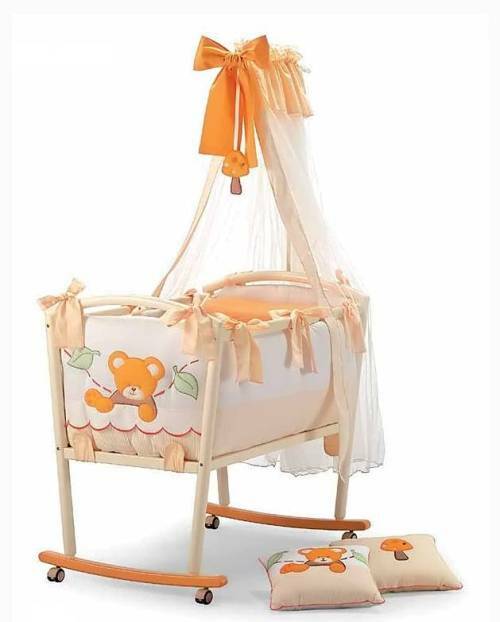 Decoration for a child's crib bears not only aesthetic but also the corrective function. Most of the time your toddler to stay in bed and decorations help to develop attention and memory. While the child is very young, purchase a bed with a canopy. Graceful canopy will help protect baby from insects, light, and possible drafts. But once the baby is older, ruthlessly get rid of the canopy. The child is not aware of the dangers and can firmly clinging to the fabric, to bring on himself all this Grand design. In addition, the fabric curtain serves as a great "dust collector", and the dust is known to cause allergies. So if you purchased a crib with a canopy, remove the fabric and wash it as often as possible. The headboard, if it is solid, decorate with applique or, if you have the time and ability, razreshite funny animals. Only use for this paint is water-based. They are not toxic, have no smell and therefore are best suited for use in the nursery. When the baby will begin to more consciously take on the world, he likes to consider bright pictures. Use in the future, these ornaments for the development of the baby. Think of the tale of the painted characters and tell them good night baby. Perhaps when the child grows up he will invent stories of his favorite heroes. Buy a mobile and hang it over the crib. Bright, rotating toys will attract your baby attention. The kids love the rattles. Buy a special plastic toys strung on durable elastic. And hang, attaching to the sides of the bed. How to decorate baby cot? The easiest way is to buy beautiful linens. You can, as long as you want to fantasize on the theme of decoration, but without good clothes to the crib everything exactly is not too aesthetic. Do not purchase for a small child duvets and pillows. The fluff can cause allergies.How to decorate baby cot, prompt your own imagination. Show the skills of needlework, and your baby will fall asleep in the most original beds which have ever existed.